As far as measures of retribution are concerned, this NBA Finals went off without a hitch. The Heat lost to the heat before losing to the Spurs. Which one was more impactful will be Twitter fodder for months to come, though the answer is truly (painfully?) obvious. Tim Duncan re-asserted his claim as the best player of his generation, as well as his astute normcore brilliance. Kawhi Leonard has become the Duncan to Duncan’s David Robinson, hopefully. LeBron James has some serious pondering ahead of him. Basketball is fun. 1. The San Antonio Spurs are the rightful NBA Champions, whatever that means: Throw your Heat in the fridge. Take it easy with your Splash Brothers talk. No, Roy Hibbert didn’t show up to play foil to LeBron, and no, the Dwightmare’s after-effects with James Harden in Houston did not create a mid-’90s, Jordan-less throwback moment. Cool it down with #LETRUSSELLBERUSSELL and your (my) @kdtrey5 shout-outs. These San Antonio Spurs drove and dished, posted and toasted and played impeccable defense on one of the most powerful offenses in the league. People will say that this Spurs team “won the right way,” likely amid talk of karma killing Miami after its deck-stacking led to two titles and four Finals trips since LeBron and Bosh arrived in South Beach. Really, it was playing to the NBA’s rule system and taking advantage of an older, more brittle Heat team which led to San Antonio’s redemptive triumph. Dwyane Wade was a problem, but we’ll get to that in a minute. For years, the Spurs have been running a high pick-and-roll with Tim Duncan and Tony Parker, and this Finals was the crowning moment of that style of offense for Gregg Popovich, who provided perhaps the best gif of the season at the victory parade in San Antonio. 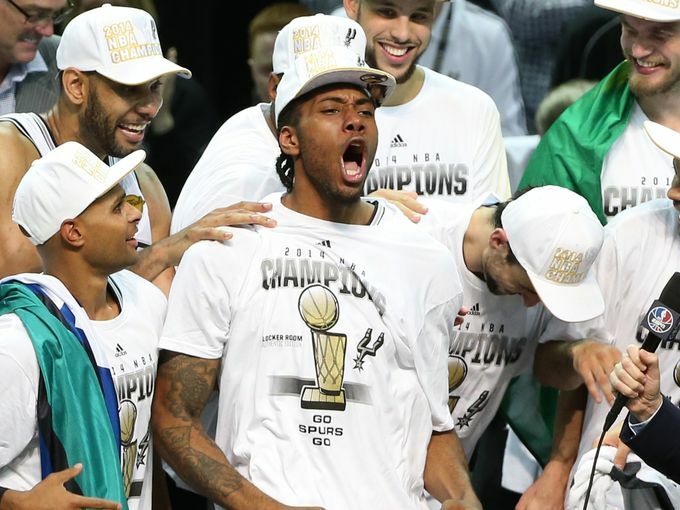 Is there anyone more likeable right now than Kawhi Leonard? His play was as near to perfect as anyone’s in today’s NBA, particularly in defending LeBron James, and his Finals MVP was well-deserved. It’s been a few weeks since Kevin Durant’s MVP speech rocked the collective conscience and gave us reason to believe that professional athletes really do care, but, as Brian Kraker pointed out last week, Kawhi could very well be the future of the NBA, or at least of stability in it. I mean, just look at what this guy did to Wikipedia following Game 5. James has a few more years at the top, and Durant might only be at the tip of his iceberg, but eventually it seems these two will give way to the Anthony Davis/Kawhi Leonard league. I, for one, welcome our potentially reptilian overlords, so long as they provide entertaining basketball night after balmy San Antonio night. If we have seen the last of Tim Duncan, we have seen one of the best players of all-time play out maybe the finest top-to-bottom professional basketball career ever. Even though he wore jorts to Game 4, an undeniably average and almost, almost off-putting act, it will not diminish the respect he garners around the league. His resistance to positional pigeonholing foreshadowed the multi-talented players of this generation, players whose size once suggested center but whose ball-handling and shooting abilities are more reminiscent of forwards and guards. NBA All-Star balloting doesn’t feature the center position anymore, and that has as much to do with Tim Duncan as it does with anyone else of the last fifteen years. He and Gregg Popovich may very well be the last dominant player-coach combination for years to come, and we may never see it again. Once described as “boring” by drive-by observers and self-styled basketball “aficionados” who grew up on the high-flying, high-scoring acts of players like MJ, Vince Carter and Kobe Bryant, Duncan’s fundamentalist philosophy, combined with the Spurs’ adherence to consistency, will form the building blocks of anyone whose athleticism and size affords an opportunity to play in the paint as more than just a rim protector. It is assured that we will almost certainly never see a player of Duncan’s caliber and poise again. 2. The Miami Heat couldn’t take it and got out of the kitchen: Talk of a three-peat preceded the Finals, and it seemed as though teams, as well as fans, were in for a classically monumental grudge match between the two best teams of this decade so far. Unfortunately, the Spurs executed too well, and the Heat played out of sorts due to a variety of factors Chris Bosh became a non-entity after two great shooting performances to start the series, and Miami’s bench was horrendous, providing no support to an overworked LeBron James. We’ll get back to that guy shortly. Mario Chalmers found himself in trouble on both ends, often losing his composure on defense and totally misplacing his shot on offense. His ineffectiveness became apparent early on, but the Heat had nothing with which to replace him. Norris Cole barely registered in the box score. The Rashard Lewis renaissance found its final resting place in San Antonio. Erik Spoelstra’s confusing rotations, particularly toward the ends of games, doomed the Heat. Trotting out Udonis Haslem to slow the bleeding caused by either Tim Duncan or Tiago Splitter in the fourth quarter seemed not to be the way to victory. Miami simply seemed to be in awe of the way San Antonio played basketball throughout the series. It often appeared as though they were doing nothing more than acting as placeholders to watch the marvelous spectacle unfolding before their eyes, mostly because they couldn’t have done anything to stop it even if they had tried. The Heat players looked old and tired, and no one looked more tired than the man who predictably attract the most attention this offseason. 3. LeBron James, and the captivating conundrums in South Beach this summer: These Finals were a case study in moderation. Gregg Popovich restricted his Spurs stars perfectly during the regular season so that they would peak, like Olympians, at just the right time. Erik Spoelstra, on the other hand, allowed Wade to rest whenever he didn’t feel up to a given challenge and kept LeBron James on the court for almost 3,000 minutes this season, good for a sixth-overall 37.7 minutes per game. That kind of load wears on a player. Just ask Carmelo Anthony last year, or any year since he’s been with the Knicks. James arrived at the Finals a tired man, and his team was nowhere in sight to help him. Too often, James found himself playing point-forward, which is a perfectly fine way to run an offense if the supporting cast can move the ball sufficiently after the first pass. If it can’t, team play suffers, and an individual’s success only goes so far in what the Spurs proved to be is still a team game. LeBron will earn gripes about the Cramp Game and his failure to stymie a Spurs team which featured a hobbling point guard, but he deserves to shoulder none of the blame. In the five games of the Finals, James averaged 28.2 points, 7.8 assists and 4.0 rebounds as well as shooting 51.9% from 3-point range in 38 minutes played. This isn’t the “cracks under big-game pressure” LeBron of your older brother; he has two rings already, and he showed up in this series, despite the best efforts of Finals MVP Leonard. Somewhere, Gregg Popovich, R.C. Buford and Tim Duncan read that quote and smiled, thinking how much it reminds them of themselves a decade or so ago.